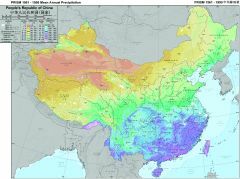 Visualizing China’s Future Agriculture is a new atlas — sample pages, sample maps — that is the result of a decade-long collaborative project of the Oregon State University China Working Group. As the Medford News reports, “It is the first work of its kind to offer an extensive collection of maps that show climate, soil characteristics and plant species suitability for an entire country.” In limited supply; nearly 300 pages of full-colour maps; coil-bound; $200. Via GeoCarta and Cartography.